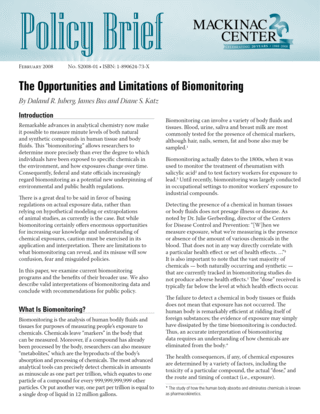 The importance of accurate interpretation and reporting of biomonitoring data cannot be overstated. Erroneous information too often taints public policy debates, resulting in costly and even deadly consequences. The United States’ ban on DDT, for example, was based on faulty assumptions about the risks of exposure; whether any lives were saved is questionable. But the ban did reduce the availability of the pesticide overseas, thereby increasing deaths from malaria and West Nile Virus by millions. Similarly, safe genetically modified foods are being withheld from starvation-plagued Africa as a “precautionary” measure. A California-based group called Commonweal garnered headlines and calls for more stringent chemical regulations following release of a biomonitoring “study” documenting “chemicals … turning up inside the human body.” The group had measured the levels of 25 chemicals in only 11 people, but still made much of the fact that the testing found “measurable levels” of several compounds. As noted earlier, the mere existence of a chemical in body fluids or tissues does not correspond to a health risk. An environmental advocacy group reported its “findings” that common chemicals were detected in the blood of the umbilical cords of a handful of newborns. Chicago Tribune columnist Judy Deardorff fretted in print about her unborn baby “stewing in toxins.” But the purported study did not indicate that the levels of chemicals detected posed any risk to either baby or mother, nor was the sample of test subjects of adequate size to generalize about the findings. Concern spread among nursing mothers following a report claiming that flame retardants are becoming more common than PCBs in breast milk. But the simple presence of a chemical, even one used in fireproofing, does not necessarily indicate a harmful effect on human health. Moreover, the research, which was conducted by the Sightline Institute (formerly Northwest Environment Watch), involved only 40 women — a number that is not a representative sample of the population. Each of the “studies” cited above presumed erroneously that the mere presence of chemicals in the human body constitutes a potential health hazard, a presumption based primarily on tests in which animals were subjected to far greater chemical exposures. Such alarmist interpretations can have broad societal impact when they unnecessarily frighten people and provoke calls for unwarranted — and costly — government action. To the extent attention and resources are diverted to phantom risks, the nation’s financial and intellectual resources are less available for genuine threats to public health. Moreover, wasted economic resources reduce our collective wealth, which is precisely what defines the difference between environmental well-being and ruin. Underdeveloped nations tend to be the most polluted and sickly.